Treks in Nepal offer visits to isolated, remote and charming regions and villages. Often these lie at the foot of mountains and faraway destinations. March marks the beginning of the regular trekking season of spring in Nepal. The number of trekkers trekking in Nepal in March increases by mid-March. 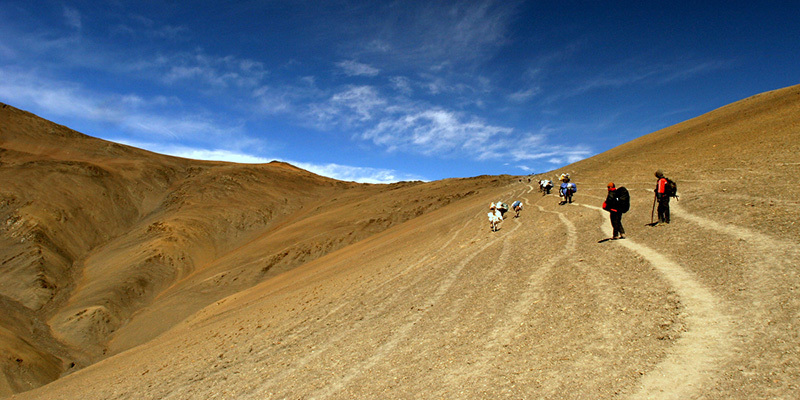 Trekkers in Nepal in March get to walk on dry, winding trekking trails. Most trails pass through alpine forests, flowering meadows and forests, dainty villages and small towns. These also offer a clear view of surrounding landscapes and mountain peaks in March. Nepal has 4 distinct seasons. March marks the official beginning of the spring season. It is the 2nd most popular season for trekking in Nepal. Above 4000m, the temperatures can drop below zero in early morning and nights. In the lower regions of most treks, you can enjoy mild weather. 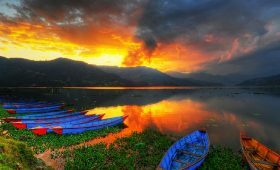 The temperature at Kathmandu, Pokhara averages between a 20-26 degrees Celsius. The average temperature dips with the increase in altitude. March is a dry season. Yet, you may encounter occasional thunderstorms, hail showers, snow during March. Yet, these are short and infrequent which doesn’t affect your trek much. The skies are clear and give you an awesome view of the majestic mountain peaks. The sunrise and sunset amidst the mountains are at its best. The beginning of spring in Nepal is when nature comes alive after the winter slumber. It brings the start of a new life for plants, vegetation, and forest. The spring blossoms fill the trees throughout the forest’s trail in the lower regions of the trek. The most prominent of these is the colorful and vibrant blooming of Rhododendron. You can see this in the Annapurna, Manaslu and Langtang regions of Nepal. March starts out with approximately 7 hours of daylight. This increases as March progresses. You can enjoy your walk at a slow and relaxing pace. You will not have to rush. Treks to both low and high altitude will be enjoyable and comfortable in March. With a diverse landscape, Nepali land offer numerous trek durations, routes, and destinations suitable for all. You complete the entire trip in less than 11 hours. This includes the drive and break duration. Nagarkot is a popular spot in Nepal for sunrise and sunset views. In March, the clear skies allow you to witness five of the world’s 10 highest peaks on this hike. You get a superb view of Mt. Everest, Lhotse, Choyu, Manaslu and Makalu. Nagarkot is only 32 km east of Kathmandu. The Nagarkot hike takes around 8-9 hours. Chisapani Nagarkot trek is more like a pilgrimage tour in Nepal. It takes you to some important and interesting natural and cultural sites. On this tour, you will hike across the hills of Kathmandu valley. It is perfect for individuals who do not want to trek to the high altitudes. During March, you can see the entire Kathmandu valley from various points of this tour. You can also get views of spectacular, snow capped mountain peaks as well. Langtang Valley Trek is one of the more accessible and easier treks of Nepal. 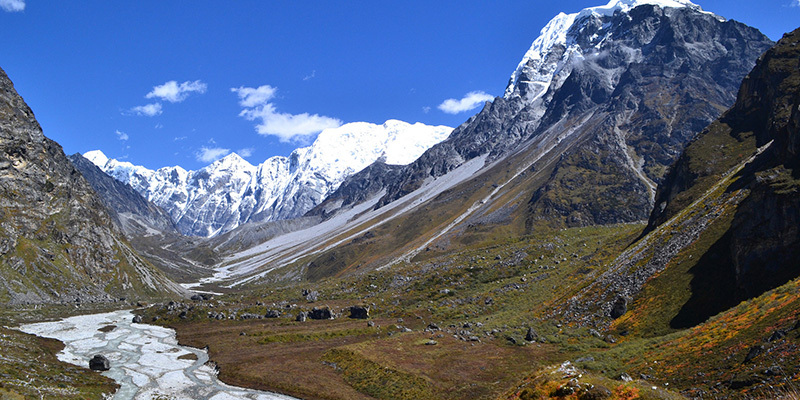 This trek takes you to the valley of glaciers- Langtang Valley. You start your trek in Syabrubesi through dense forests of pine, rhododendron. In March, you can witness the early blooms of the colorful rhododendron and wildflowers. You will also trek inside Langtang National Park. This park is home to a diverse range of flora and fauna. You will also pass quiet Tamang and Sherpa villages on this trek. March offers clear skies. Hence, you can get magnificent views of the surrounding mountain peaks. Like the name suggests this trek offers you with the most beautiful panoramic view of Annapurna. You also get to explore quaint and traditional villages. Poonhill, one of the must-see destinations of Nepal is a part of Annapurna Panorama trek. For those who do not want to undertake the Everest Base Camp trek yet want to get a close view of Everest, this Everest View trek will be the ideal choice. This is a popular mini-trek in the Everest region of Nepal. You get exceptional views of mountain peaks, flora and fauna of Everest region. You will also visit Namche Bazaar. It is the main trading center of the world famous ‘Sherpa’ people of the Khumbu region. These include a wide range of treks between 2 weeks to months long treks in Nepal. The long duration treks include relaxing treks that have many rest days or less walking hours. It also includes treks of the strenuous grade. The is the classic Everest Base Camp trekking route. This was the route used by the first successful climbers of the Mount Everest- Tenzing Norgay Sherpa and Sir Edmund Hillary. This is an old and classic route. So, you will not have any problem with finding accommodations or places for meals. In March, the warm days with fewer crowds are great for trekking. You will pass through several popular landmarks of the Everest region on this trek. This includes Tengboche Monastery, Everest Base Camp, Namche Bazaar, Sagarmatha National Park. 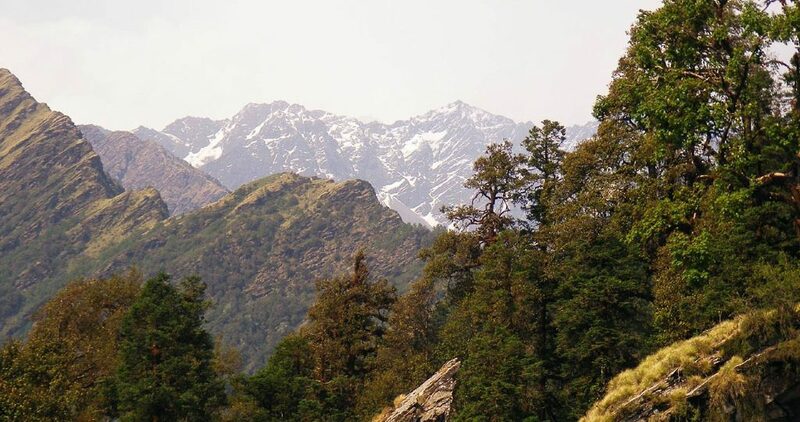 On this trek, you are bound to get fabulous views of some of the highest peaks in the world. Some famous ones to look out for are Mt. Everest, Nuptse, Thamserku, Lhotse, Ama Dablam, Mt. Kwangde. Annapurna Circuit trek circles around the Annapurna Mastiff. 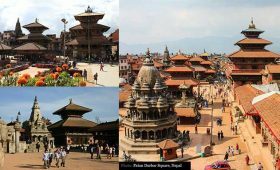 It is a remarkable route through diverse landscapes and culture of Nepal. You get a real taste for the rich diversity in nature and culture in Nepal. Along with this, you get spectacular views of the white Himalayas. In March, the majestic splendor and view of the place is your constant companion. Some popular tourist destinations of Nepal also lie on this trek. You will walk through the desert country of Manang and Mustang. You can also take a dip in the natural hot spring of Tatopani. 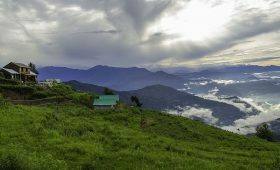 Indulging in the fabulous views from vantage points of PoonHill is also part of this trek. Yet, for those who want to skip the popular trekking trails of Nepal, there are other options. These trails and destinations take you through the wild and rustic nature of Nepal. These trails are the less traveled parts of Nepal. Maybe the road less traveled appeals to you. This trek takes you to the ninth highest altitude wetland in the world, Panch Pokhari. Located in Nepal’s Sindhupalchok district, this is one of the newly opened trails of Nepal. You will witness five sacred Hindu holy lakes at 4010 m on this trek. There are very few tea houses on this trail. Hence, camping is a reliable option. 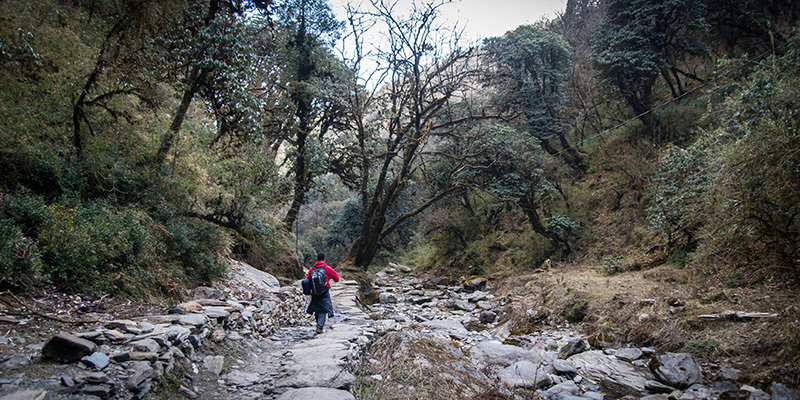 The trek takes you through settlements of Sherpa and Tamang communities. You have the opportunity to understand the Himalayan culture and lifestyle. You also get stunning views of mountain peaks. Some of the mountains you can see are Dorje Lakpa (6966m), Phurbi Chhyachu (6637m), Madiya (6257m). You can also see Rolwaling Himal range, Ganesh Himal range, and Langtang Himal range. Dolpo is one of the most remote regions of Nepal. Dolpo trek takes you through upper and lower Dolpo. It is long and strenuous trek. You will trek 200 miles, cross 5 passes over 16500 ft. and walk 15-18 km per day. This trek is perfect for those looking for adventure and treks to the less traveled way. March is the beginning of the spring season. This comes with clear skies and warm temperatures. You also get stunning views of the mountain peaks and surrounding landscapes. The days become warmer and longer giving you more time to trek and enjoy the beauty of the trails. As March is the beginning of the peak Spring season, the crowds are yet to come. You can enjoy the start of the trekking season in peace and tranquility. You will not have to rush to get your choice of accommodation and rooms. You will not have to queue for meals or best spots for mountain peak viewing. Due to the ethnic diversity, you can indulge in festivities in almost any month of the year. Yet, March offers some of the most colorful festivals to celebrate the spring time. Maha Shivaratri translates to ‘Night of Lord Shiva’. During this day, devout Hindus bath early in the morning and fast for the whole day. During the day, they visit temples dedicated to Shiva. The best places to witness this festival is Pashupatinath temple in Kathmandu. Holi is the festival of colors. The Nepalese celebrate the festival to welcome spring and warmer days. On this festival you get to play with various colors and water. In March, dressing in layers during the treks is ideal. While packing you need to be careful not to miss the most important gears and clothings. While trekking you will be in high altitude and in cold for several days. So, proper packing must be your prime concern for trekking in Nepal in March. You may think of carrying your own luggage. But, please re-think about it. Your luggage will have all the trekking equipment, clothing, and supplies. In the high altitudes, carrying an extra load during the trek can drain you. 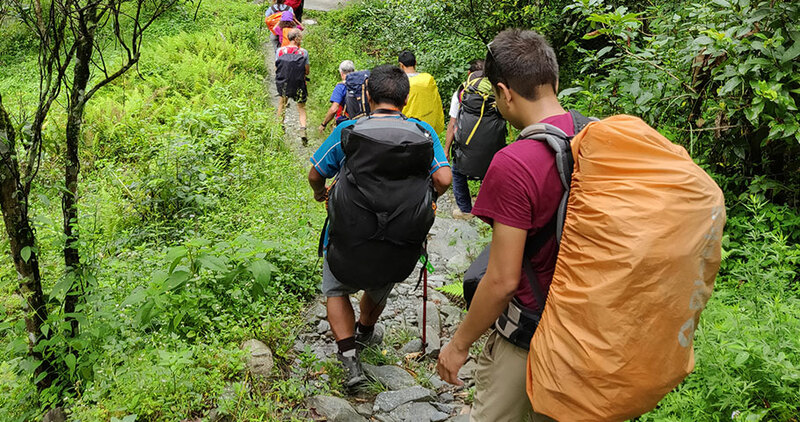 You might end up feeling exhausted and miss out on the fun and adventure of the trek. So, it is a good idea to hire a porter to help carry your load and accompany you throughout the trek. An experienced, professional trekking guide is always recommended. Licensed guides are well-informed of the high altitude treks. These guides will know the trails well enough to suggest the best rest houses, tea houses. They can also answer any queries you may have during the trek. This can include the mountain peaks you see, the flora and fauna you notice or few local words. You have little to no chance of getting lost with a professional and licensed guide. They can help you interact with the locals. All these help improve your trekking experience. During early March you may feel less thirsty because of the cold and humid atmosphere. This may lead to dehydration during the trek. And a dehydrated body may lead to altitude sickness. So, for a healthy trekking you must drink plenty of water and maintain body hydration. March is the beginning of the peak season for treks in Nepal. Make sure you book everything in advance. This includes your flight tickets, accommodation, and tea houses. Advance booking ensures a smooth and comfortable trekking experience. With early booking, you do not have to run for the rooms or food. Anyone can get altitude sickness if you don’t take necessary precautions. This is true for high altitude treks throughout the year including March. There are different ways to reduce and prevent altitude sickness. Some of them are by training well, eating well and staying hydrated. Slow and steady pace during the trek also helps reduce the chances of Altitude sickness. Also, never skip your acclimatization days. They are there for your safety. Treks are an adventure sport. Like any other adventure, treks have their own risks. Travel insurance is a must for safety reasons. In high altitude regions, there are fewer facilities of health care. If you do get sick or injured out there, helicopter rescue is the only option. Having travel insurance ensures you get this facility immediately when needed. Travel insurance is also necessary to keep your mind at peace. You will not have to worry about all the what-ifs related to falls, trips, sickness. Most reliable and reputable trek operators do not accept clients without travel insurance. Make sure you get one from your host country. Also, make sure it covers for high altitude treks in Nepal. Make sure you check the guideline for trekking essentials for your treks in Nepal in March. You don’t need to buy all the trekking gears, equipment, clothing for your trek. Most of these are available for buying and rent in Kathmandu and Pokhara. Once you buy or rent them, make sure they are durable and reliable enough to last you the trek to come. March is the beginning of the peak trekking season in Nepal. The days are warm and long to maintain slow pace during the treks. You can enjoy the majestic views of mountains, landscapes, and flora with fewer crowds. As March is the start of peak season, the crowds are yet to arrive. You can enjoy all the perks of Spring season trekking in Nepal without the cons. If you have any further queries or questions to any treks in Nepal, feel free to contact us. You can also contact us to create your own itinerary for any trekking destination of Nepal.